UPDATE [2/13]: I received word from Dr. Skousen tonight that attendance at the lectures may be quite high due to large numbers of BYU students attending. He strongly recommends that you arrive no later than 6:30 pm. Frankly, I’d recommend 6 pm and bring a good book (or an iPad). Yes, yes, I know, I haven’t posted much here in ages. I burned out a bit on blogging last year, but I may be starting up again. All three lectures are being held at the Gordon B. Hinckley Center on the campus of Brigham Young University; they are free and open to the public. I actually hope to make the first lecture myself, since business will have me in Utah that week. As someone who has read most of what Skousen has published to date on the Book of Mormon critical text project, I highly recommend these lectures. ..bruce.. I wrote yesterday about how the Deseret News has managed to actually increase its paid circulation by focusing more on a specific target audience — Mormons — while the Salt Lake Tribune declined in paid circulation at the same time. I talked to many faithful LDS Church members this week after a story about “Big Love,” HBO’s polygamy drama, appeared in The Tribune alongside a photo of one of the characters wearing temple clothing known only to devout members of The Church of Jesus Christ of Latter-day Saints. Trust me, Pandora’s box is ajar and the bad feelings are in the ether. . . .
By Friday afternoon, 1,111 readers had commented on the online version of the story at www.sltrib.com. Although a tightly cropped version of the photo appeared in the print edition, the larger shot was pulled from the Web site and the photo archives as soon as Tribune Editor Nancy Conway saw it. She believes the photo added nothing to the story by Vince Horiuchi about the controversy surrounding the episode that airs Sunday evening. That episode reportedly will depict a rite that members consider sacred and private. . . . But I can assure Mormons that The Tribune did not intend to offend members of the LDS Church. We should have more carefully considered what using the photos would mean to Latter-day Saints. Note, by the way, that I think that the Tribune had every right (under the 1st Amendment, etc.) to run that photograph; in that, I happen to agree with Vince Horiuchi (though not with his snarky tone). But as we like to remind ourselves in the Church, you are free to choose your actions; you are not always free to choose the consequences. And given the Tribune‘s circulation struggles, this may not have been the wisest course of action. ..bruce..
Deseret News — Once upon a time the Deseret News, the Church-owned newspaper in Salt Lake City, carried on a highly entertaining feud with the anti-Mormon Salt Lake Tribune. In these calmer days, the Tribune and the News share the same adverstising office, cooperate on the Sunday edition, and never exchange so much as a snide word. Oddly enough, however, Mormons still get some small rebellious satisfaction out of subscribing to the Tribune, and non-Mormons regard the Church paper with suspicion. There was an interesting article by Paul Beebe in yesterday’s Salt Lake Tribune about the travails of the Tribune and the Deseret News in today’s tough market for newspapers. However, Beebe buried the real lede, and quite possibly deliberately. Last month, 10 News reporters removed their names from stories they had written for the Feb. 23 paper to protest Editor Joe Cannon’s strategy to make the LDS Church-owned paper more pleasing to Mormons — and more profitable. Cannon sees the strategy as a way to allow two daily papers to remain viable in a market of Salt Lake City’s size. The reporters were also protesting the demotion of two editors who objected to the paper’s drift. Cannon’s strategy appears to be working. Paid circulation increased 2.1 percent in the six months ending Sept. 30. The News was one of a few big-city papers to add readers during the period, according to Audit Bureau of Circulations figures. If you have been following newspaper journalism at all for the past few years, you’d know how remarkable that is. I’d be interested to find out what other “big-city papers” have increased in circulation during the last six months; most of the focus these days are on the ones that have already closed up shop (like my town’s own Rocky Mountain News) or are likely to do so soon. So the fact that the News increased its circulation, in a city as relatively small as Salt Lake and with another competing daily newspaper, is major journalistic news indeed. The larger Salt Lake Tribune is coping with circulation and advertising declines of its own. Paid readership dropped 5 percent in the six-month period, according to ABC. So far this year, revenue for both papers is down 20 percent. Although the circulation losses are blamed on a cost-saving move to pull Tribunes from numerous hotels in Utah, editors see them as additional confirmation that the newspaper must branch into new areas if it is to keep its leading role. So the question is: will Salt Lake City be a one-paper town (as Denver now is) in a few more years? ..bruce..
FOLSOM, CA – A Folsom investment firm that allegedly ran a $40 million Ponzi scheme drew largely from members of the Church of Jesus Christ of Latter-Day Saints, according to federal investigators. Equity Investment Management and Trading, Inc. was headed up by Anthony Vassallo, 29. A professional networking Web site indicates Vassallo attended Brigham Young University between 1998 and 2003. The alleged Ponzi scheme came to light Wednesday when the Securities and Exchange Commission filed a civil complaint in Sacramento federal court seeking to seize assets held by EIMT and levy fines against Vassallo and company vice president Kenneth Kenitzer, 66, of Pleasanton. The complaint claims as many as 150 victims, drawn largely from Vassallo’s religious community, invested $40 million between May 2004 and November 2008. One on those alleged victims is Kevin Stillion, 38, of Rancho Murieta, who said he gave Vassallo his life savings of $120,000 to invest in April of 2008. “We know that we do have an account that does have some money in it, but it’s less than two percent or one percent,” Stillion said. Here’s the corresponding press release from the US Securities and Exchange Commission. God will bless me financially if I pay my tithing, etc. Investors big and small were swindled, from Florida retirees to celebrities such as Steven Spielberg, actor Kevin Bacon and Hall of Fame pitcher Sandy Koufax. Many of Madoff’s victims were Jews and Jewish charities, which trusted him because he is Jewish. Those cheated included Nobel Peace Prize winner and Holocaust survivor Elie Wiesel. Investigators said investors were lured with the promise of monthly returns as great as 3.5 percent. This is exactly the same thing that Madoff used to get his investors, though his standard pitch was a mere 1 percent/month (the FBI does say he did make some claims of annual returns approaching 45 percent, but the 1%/month figure shows up most often). That claim alone should have been enough to warn people away, particularly in an era where you’re lucky if your money market account offers a 3.5% annual return on saving. Stillian [one of the victims] said he is not a member of the LDS church, but has Mormon friends who introduced him to Vassallo. “It was all about friends and family and trust,” he said, adding, “I sat there in his office and he showed me the returns,” Stillian said. Dating all the way back to my undergrad years at BYU, I have made it a matter of standing policy that whenver anyone tries to get money from me (selling me something, investing, etc.) and brings the Church or related issues into it, my response is an automatic and irrevocable “No.” Any appeal to Church membership, Church authorities, personal claimed worthiness (“When I was in the temple the other day…”), etc., is a big red flag that the pitch being made cannot stand on its own merits. The sad thing is that most Mormons are honest in their dealings with others, including their fellow Mormons. Tthat’s what makes the occasional fraud like this both effective and devestating. Those who take advantage of that trust are truly wolves in sheep’s clothing. Like the moneychangers in at the temple in Jerusalem, they turn the house of God into a den of thieves — but, unlike the moneychangers, they do so having sworn a solemn oath to take Christ’s name upon themselves. I for one would not want to be in their shoes when they face the Savior’s wrath. ..bruce..
MANAGUA, Nicaragua – Tropical Storm Alma lashed the coast of Central America with heavy rains on Thursday after becoming the first such storm of the eastern Pacific season. Authorities issued a tropical storm warning from Costa Rica to El Salvador. Costa Rican authorities evacuated low-lying areas and set up more than 160 storm shelters after Alma dumped rain over the country for 24 hours. A few highways were blocked by landslides. The National Hurricane Center in Miami said the storm had maximum sustained winds of 45 mph (75 kph) and was expected to strengthen before hitting Nicaragua’s northwest corner later Thursday. The storm was moving north at 6 mph (9 kph). The center predicted it would plow through the southern border region of El Salvador and Honduras early Friday. And mostly in my old stomping grounds, no less; I served in the Central America Mission (1972-74), which included Honduras, Nicaragua, Costa Rica, Panama, and the Canal Zone. I hope everyone down there gets through this OK. ..bruce..
Sandra and I lived in Washington DC — in the District itself — for nearly six years (1999-2005). During most of that time, a major issue was where the Church would build a stake center if and when one was built in the District itself. (The Washington DC Stake center is actually located in Kensington, MD, next door to the Washington DC Temple.) The sad part was that the Church had owned a rather large chapel right in DC many years earlier, but had sold it to another church. It’s not just the traffic and parking congestion that they predict the Mormons will bring to 16th Street Heights, their lush residential neighborhood north of Mount Pleasant. And never mind that the area already has a dozen or so congregations, not to mention a host of other institutions such as schools and day-care centers. But a tower that’s the equivalent of 10 stories high? Gloria Eblan, a software engineer who lives across from the property, at 16th and Emerson streets NW, envisions the kind of raucousness associated with a throbbing nightclub, not a church. She insists that a jackhammer-thumping construction project, followed by a weekly parade of chattering congregants will disturb her ever-precious peace. Dozens of homeowners have expressed opposition to the new church with lawn signs that read, “Too Big, Too Much, Too Many.” And the Mormons are finding little support from the neighborhood’s clergy, including one pastor who said his objection is rooted not in architecture, but theology. Mormon leaders have been surprised by the opposition, in part because so many churches are located there. But they said they’re confident that their reception will improve once they build their two-story brick church, which will host two Sunday services and seat 240. The church will offer underground and aboveground parking, which the Mormons promise will minimize the congregation’s affect on the neighborhood. I’ve driven up and down 16th Avenue many times. As the article notes, there are many, many churches along that road. The building of an LDS stake center there is not going to change or spoil the look of the neighborhood along that road. This appears mostly to be religious NIMBY mixed with ignorance and some genuine religious bigotry. ..bruce..
Gordon B. Hinckley, 15th President of the Church of Jesus Christ of Latter-day Saints (Mormon), passed away earlier today, at age 97. No man ever came to office of LDS President more prepared than Pres. Hinckley. Long before he was called to the Quorum of the Twelve in 1961, he traveled the world for the LDS Church, helping to establish missionary efforts in countries where the Church had little presence. In 1981, he was called as a counselor to the First Presidency and within a short time found himself as the only fully functional member of that Presidency, as old age and illness limited the activity and capacity of both Pres. Spencer W. Kimball and 1st Counselor Marion G. Romney. He encountered a similar situation as a counselor to Pres. Ezra Taft Benson. Through both periods, he showed the greatest respect, restraint, and deference to the President of the Church. Finally, upon the death of President Howard W. Hunter, he became the 15th President of the LDS Church — and unleashed an era of change and worldwide expansion that had not been seen since the administration of Pres. Kimball 20 years earlier. There are many things for which Pres. Hinckley will be remembered, including his quick wit, his frank talks at General Priesthood Meeting, and his amazing global travels over the past 50 years. But a century from now, I believe he will most be remembered for the incredible expansion of LDS temples worldwide. When he came into office in March of 1995, the LDS Church had just 47 temples in operation worldwide. Today, just 13 years later, there are over 124 temples in operation, with another 12 announced or under construction. If you’ve read Pres. Hinckley’s biography, you know that during the years his family was growing and growing up, he would constantly remodel and expand their family home as required, doing all the work himself. However, in his later years, he and his (late) wife Marjorie moved into an apartment in downtown Salt Lake City next to the Church Office Building. While Sandra and I lived back in Washington DC, we got to know a sister in our ward, Marion Hardy, whose late husband had been missionary companies with Pres. Hinckley in England many decades earlier. She told me about visiting Pres. and Sister Hinckley in Salt Lake City a few years earlier. Pres. Hinckley (or “Gordie” as she called him) was showing her around the apartment when he led her over to a closet. Smiling, he opened the door — and there, neatly organized, were the myriad of tools that he had used over the decades to remodel their old house and perform his other construction and repair chores. He had little need or use for them, but he could not bear to leave them behind when he and his wife moved downtown. There was a collective gasp as 23,000 BYU students and faculty members took in the fact that an Apostle of the Lord had just said that in a Church fireside on a Sunday evening — and then a roar of laughter that lasted for quite some time. 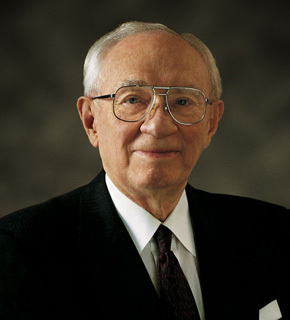 I will miss President Hinckley, but I cannot grieve too much for his passing. He served the Lord and His Church unfailingly and with great effort and sacrifice for over 70 years, and I’m sure he has missed his wife Marjorie since her death back in 2004. He deserves the rest and the sweet company of his beloved wife. May the Lord bless his children, friends, and colleagues and help all of us to live up to his example and goals. Our prayers and thoughts are also with Pres. Thomas S. Monson, who as the senior living Apostle, will serve as the 16th President of the Church of Jesus Christ of Latter-day Saints. ..bruce.. NOTE: Peggy Fletcher Stack (at the Salt Lake Tribune) has a well-written, detailed and thoughtful obituary for Pres. Hinckley. NOTE: This appears to be the origin (or, at least, an earlier version) of the joke that Pres. Hinckley told at the fireside.